For her birthday, KK organised a huge day of celebrations, starting off with a treasure hunt in a park in North London that, despite the threat of rain, looked glorious with all the leaves lying fallen in their beautiful autumnal colours. Her husband, as host, went into character as a pirate – donning a rather bad pirate’s accent in the process – and for the ultimate look in authenticity, all the clues had been beautifully hand drawn as maps, stained with tea and with their edges burnt to look frayed. My team fared dreadfully, but we all got to share in the winnings – lots of yummy chocolates – so I really had nothing to complain about. The treasure hunt was followed by drinks, which were then followed by the ultimate prize, a roast suckling pig feasting dinner at St John Bar & Restaurant in Clerkenwell, a one star Michelin restaurant which is also ranked number 14 in this year’s San Pellegrino World’s 50 Best Restaurant Awards. Having never tried the roast pig at St John’s before, I was really looking forward to it, especially because we were all absolutely ravenous from a full day of scavenging for treasure. Along with the pig, which is designed to feed 14 to 16 people, the feast includes a choice of two starters, side dishes and two desserts (pricing policy mentioned below). 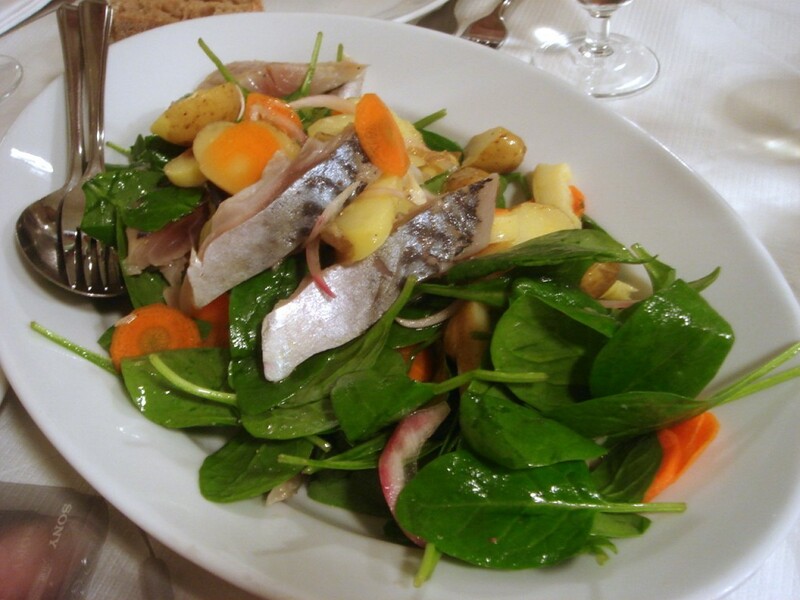 Our first starter was sweet pickled mackerel with pickled vegetables and potatoes. The fresh, fleshy mackerel was lovely. It achieved a well struck balance between sweet and sour with neither taste sensation overpowering the fish. The pickled vegetables of carrot and horseradish were crunchy, and overall this was a lovely dish. 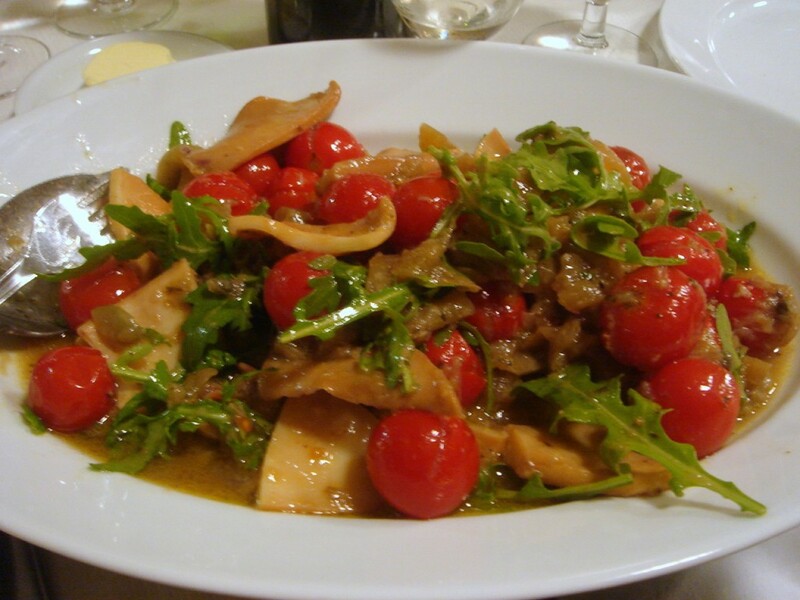 Our other starter was squid with tomato and fennel which was lacklustre and underseasoned. The squid was bland and very soft as if it had no body to it, and the use of stewed fennel was a little overpowering when taken with the bland squid. Coming from a Michelin restaurant, this dish was disappointing. To the roast suckling pig. The restaurant’s website tells you that it’s designed to feed 14 to 16 people, but there was so much meat that you could easily have fed 20 and still had some to spare. Stuffed with red onions and bread crumbs, it was cooked simply, by roasting in the oven for three hours to produce a meltingly tender result. It was very tasty with the natural flavour of the pig, and while it wasn’t dry, the accompanying gravy was a nice addition that gave the meal more moisture. However the crackling did not crackle. There was no crunch to it and it was a little chewy which was disappointing as this was one aspect of the suckling pig that I was looking forward to the most. Overall, it didn’t have the exquisite flavour and moisture of the sensational babi guling (spit-roasted pig) that I had in Bali last year – but that Balinese pig was pretty hard to beat. Still, the one at St John was very enjoyable, and there is a certain awe factor associated with being presented with a whole pig (which is then carved at a nearby table). No less dramatic was the pig’s head with a knife stuck into it that was plonked onto the centre of our dining table once it had been dissected from the rest of the pig. Sides included cabbage and potatoes, with the former being particularly delicious. 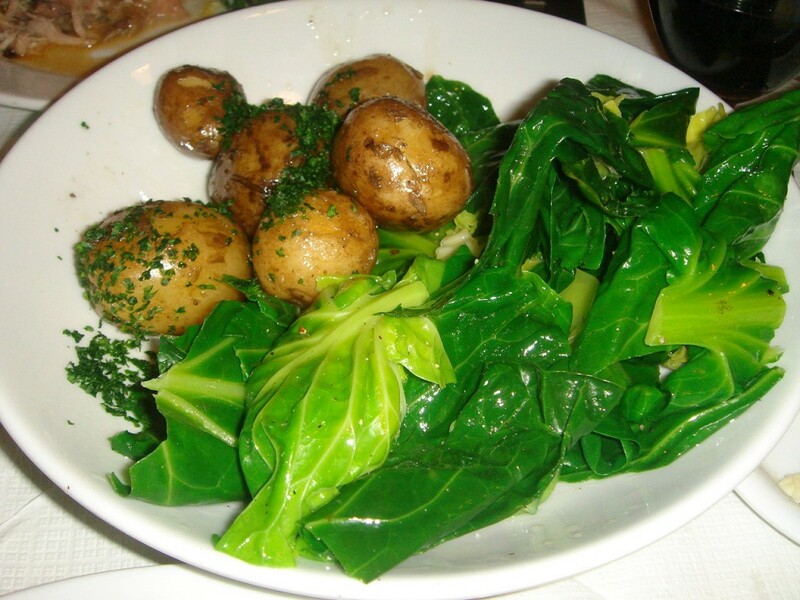 The cabbage was cooked perfectly, with a little crunch to them, and drenched in butter they were hard to resist. The sides turned up late though – we were well on our way to eating the pig before they were served to us. 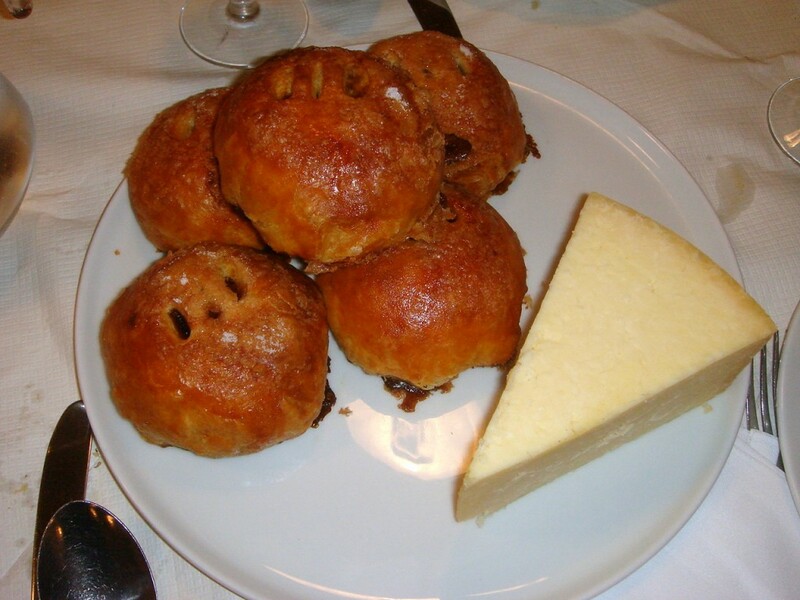 Dessert of Eccles cake served with Lancashire cheese was excellent. The pastry was beautifully light, flaky and buttery, and the combination of the cheese worked well with the sweetness of the well spiced currants that formed the centrepiece of the cake. There was also a ginger pudding accompanied by vanilla ice cream which was deliciously moist. 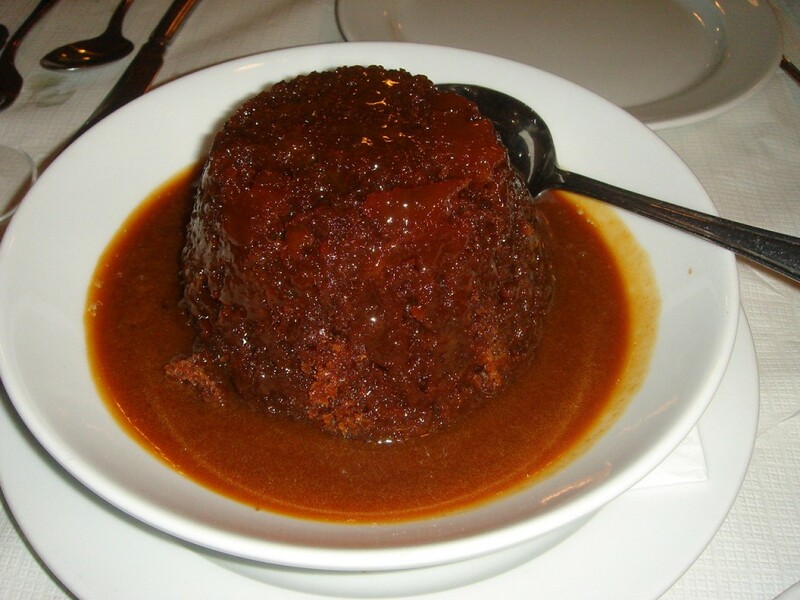 The fresh ginger in the pudding was also done to great effect and did not overpower the pudding. There was however just the slightest hint of bitterness in the caramel sauce. The service was perfunctory. Our waiter could have also been better briefed about our dishes. On a few occasions, when asked, he did not know what they contained. So what is it that makes this restaurant ranked 14 in the World’s 50 Best Restaurants? I thought the food was very good, but other than the ‘wow’ factor of having a whole pig served to us, I didn’t think that it was amazingly special. Having popularised the concept of ‘head to toe eating’, I understand the restaurant’s popular appeal, but marrow, amongst other things, are quite common place these days, and with the credit crunch, we’ve seen a resurgence in cheap cuts of meat anyway. I have also been to other restaurants that were ranked lower in the 50 Best Awards, or not even ranked at all, where I thought the cooking was better than at St John. The food is good, but I think it’s is overrated in light of all the plaudits that it has received. I suppose one can’t always take the Awards seriously in every instance. It might also interest some readers to know that St John hosted the post ‘50 Best Awards’ lunch for all the Chefs the day after the awards ceremony. Coincidence? Anyway, I’ve had my two cents worth. Other than the disappointing squid, the rest of the food was very good, with the Eccles cake and Lancashire cheese combination being excellent. Having a whole pig with a large group of people is really fun, so I’d recommend trying it at least once if you get the chance. The pig is priced at £320 and requires one weeks notice. Depending on the combination of starters and desserts that you choose, and the number of people that you have, the restaurant suggests that the minimum starting price per head usually works out at about £30 (which includes the cost of the pig). The restaurant also permits BYO. The corkage fee is £15 per bottle. Sounds like your pig was not the fabulous experience that I had when we ordered one at St John’s which is a shame. The crackling was great in our case and I was in awe of our waiters skill at carving up the pig. Still sounds like you had a fun night. My general theory about restaurants and what make some stand out, whether they are hole-in-the-wall kind of place, or luxurious Michelin star diners, is that one is wow-ed by the gap between what you expected and what you get. don’t you think it’s those unexpected, sponteneous experiences that stay with you? I was interested to read this review as I couldn’t agree with you more. 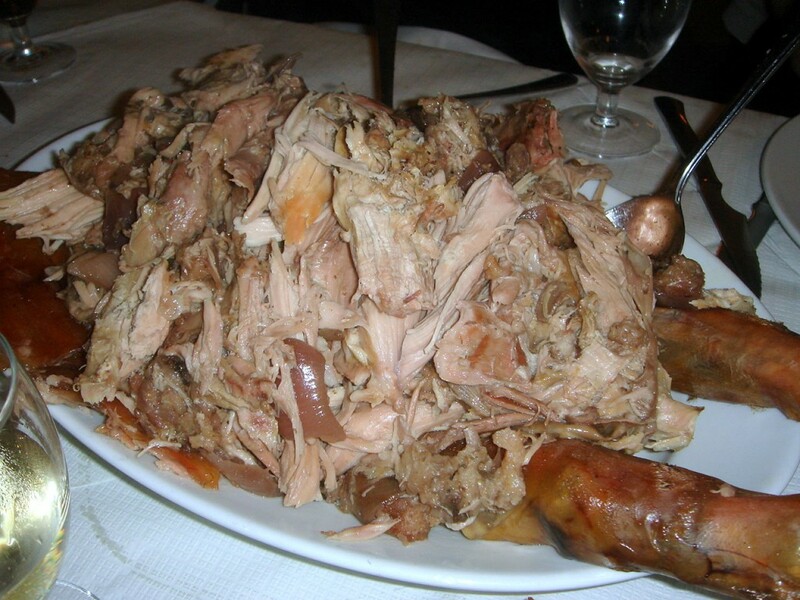 I too had the roast pig at St Johns and found it totally underwhelming. There were a few lovely moist rich chunks of meat on the pig, but it was very hit or miss with much of it overdone and dried out. The sides were totally unspectacular and the famous bone marrow was a massive disappointment after a far superior dish at Mark Hix. All in all I found the cooking to be no better than what I or my friends can do at home and the prices were subsequently offensive. I certainly think Hix is the better restaurant of the two and regret not having the pig feast there instead. I have to say (as a hungry carnivore) that it looks pretty damn amazing! But that doesn’t really matter if it doesn’t taste as good as it looks. 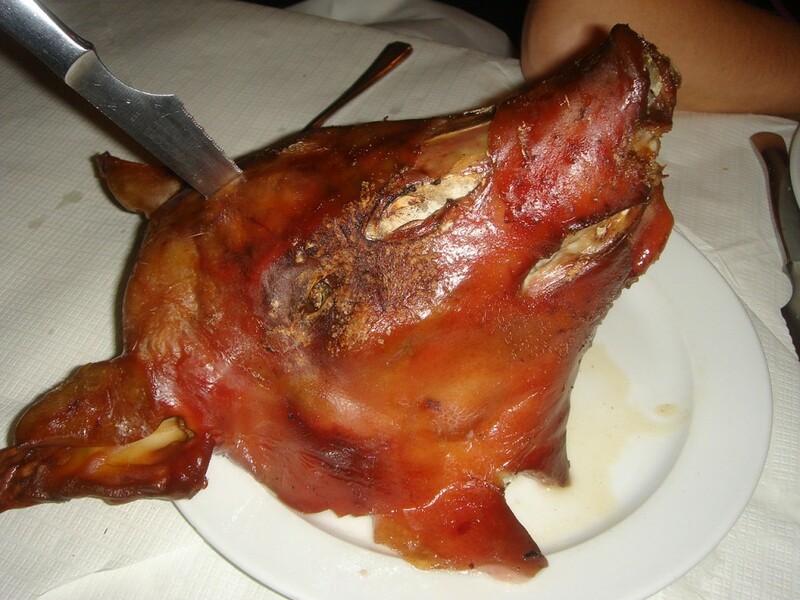 I was interested in trying out this roast pig, but the wife wasn’t keen on eating so much meat, and after this review I think I’ll visit just for the ala carte next time. 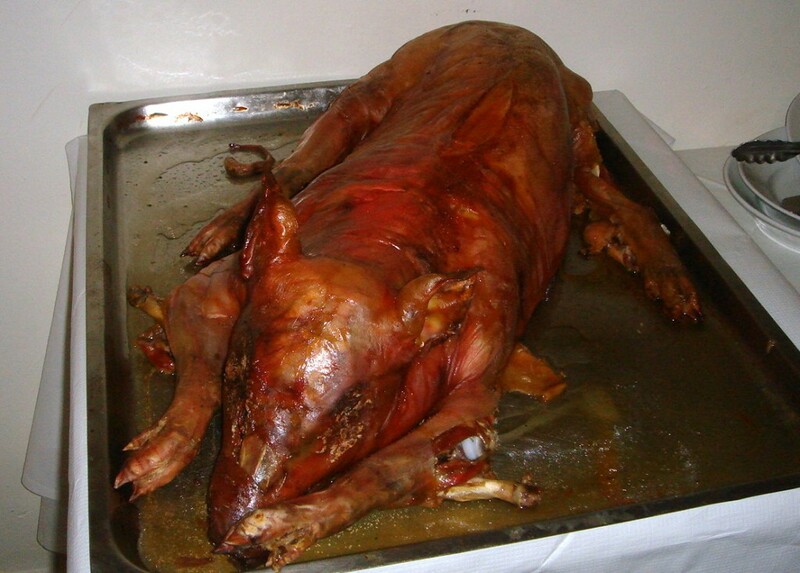 I am so happy that there is someone out there that knows just how great Ibu Oka’s babi guling is. Hmmm, craving some right now!